My family is addicted to staycations! We just love lazing in frill hotels, without really having to travel miles. What can say? Travel, relax, eat and shop: HEAVEN! For my youngest son's 4th birthday, I found a real steal deal via group buying. I bought a 2 bedroom suite at Holiday Inn Galleria - good for 4 adults and 2 kids. The package comes with a 2 BR suite (each with its own bathroom and a tub at the master's bath) huge living room, dining area and a bar, plus buffet breakfast. It was absolutely perfect for my family and my recently married sister. 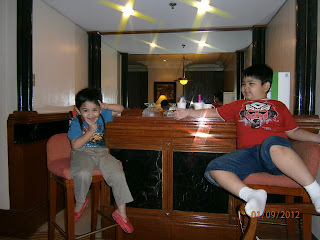 my kids - getting a feel of the bar! - a few shots maybe?